Our recent test drive revealed that the all-new BMW X7 is the perfect American luxury SUV and one of the best three-row SUVs in its class. But it will soon face some stiff competition because Mercedes-Benz is preparing to unleash the new second-generation GLS SUV. Think of the GLS as the S-Class of luxury SUVs. While we recently saw a prototype of the high-performance Mercedes-AMG GLS 63 being put through its paces, the regular GLS has shed some camouflage and is showing some of the production body painted in blue. Like the X7, the new GLS will be a full-size, seven-seater SUV. It will share the same MHA platform as the GLE, so it should be significantly lighter and more technologically advanced than the current model, as well as a formidable rival to the X7. The highly flexible MHA platform should be able to accommodate four-, six-, and eight-cylinder engines in rear- and all-wheel-drive applications, with hybridization also a possibility. 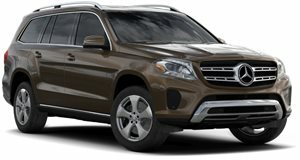 For the US market, the new GLS will likely be offered with a range of gasoline inline-six engines, as well as a hybrid version and some more powerful AMG variants. The current model is powered by either a 3.0-liter six-cylinder gasoline engine producing 362 horsepower and 369 lb-ft of torque or a 4.7-liter twin-turbocharged V8 engine that produces 449 hp and 516 lb-ft of torque. The range-topping AMG GLS 63, on the other hand, comes with a 5.5-liter twin-turbocharged V8 engine good for 577 hp and 561 lb-ft of torque. Each unit is mated to a seven-speed automatic transmission. Inside, the new GLS will be equipped with Mercedes’ new MBUX infotainment system and have a luxurious cabin befitting of a flagship SUV. Since these spy photos were sent to us, Mercedes has confirmed the new GLS will debut at the New York Auto Show next week alongside the new GLC Coupe. Mercedes says the new GLS will benefit from a 60-mm longer wheelbase, and feature three fully electrically adjustable seat rows. Like the new GLE, the next-generation GLS will feature E-Active Body Control ensuring "superior suspension comfort, agile handling and good off-road capabilities". It will also be equipped with the latest generation of Mercedes-Benz driving assistance systems.